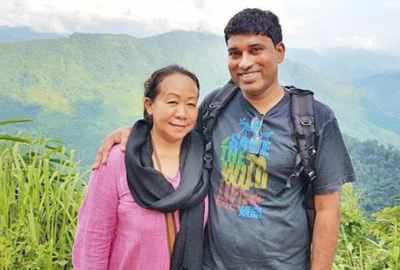 Daniel Marcus Macwan is a 43-year-old DJ-turned-conversationalist who shifted from Mumbai to Manipur’s Tamenglong town three years ago with his wife Galina Newme. A usual day in Daniel Marcus Macwan’s life often involves negotiating with poachers to buy endangered animals. Once the deal is sealed, and the sale finalized, Macwan takes these animals to his house, not to sell them to the highest bidder, but to rehabilitate them and release them into the wild again. Ever since the couple left Mumbai, they have set up a shelter home in their house and are surrounded by a wide variety of flora and fauna. “We left Mumbai and decided to settle down here because of its pristine climate and beautiful, green valleys. But when we saw wild animals and birds being gagged and bound, we could no longer be mute spectators. So, we began our campaign to save wild animals and set up the Tamenglong animals’ home,” says Daniel. As a DJ, Daniel worked at the Ghetto and Rasana Pubs, Groove, the Music Destination, Salimar Hotel, Shantranj and QI in Mumbai for nearly seven years. He was also associated with Royal Caribbean Cruises at Miami in Florida for three years. “To stop the menace of trapping and killing animals, we try to educate people about the importance of conservation. We first bought two Asian forest tortoises, each weighing around 27 kg at Rs 7000 from the Tamenglong market, and handed them over to the Manipur zoological garden authorities in Imphal,” Daniel said. The turtles were later released at Keibul Lamjao National Park by state forest authorities. “We bought a leopard cub for Rs 1,000 from a hunter. But he was too young and so we fed her with milk every three hours. Sadly, the cub suffered diarrhea and died as we could not find any vets here. We need good veterinary help here,” Daniel said.